The Plan builds on the neighborhood assets, private and institutional investments being made by Temple University, the extensive transit network in the form of buses, local subway and Regional Rail service while creating the framework to address the on-going issues of livability, safety, housing choice, schools, community services and vacant and blighted properties. The Critical Community Improvement (CCI) Plan aims to increase opportunity and improve quality of life for North Central residents through four neighborhood projects. These projects address skills training and job opportunities, public safety and walkability, intergenerational recreation and programming, and commercial and retail activity. 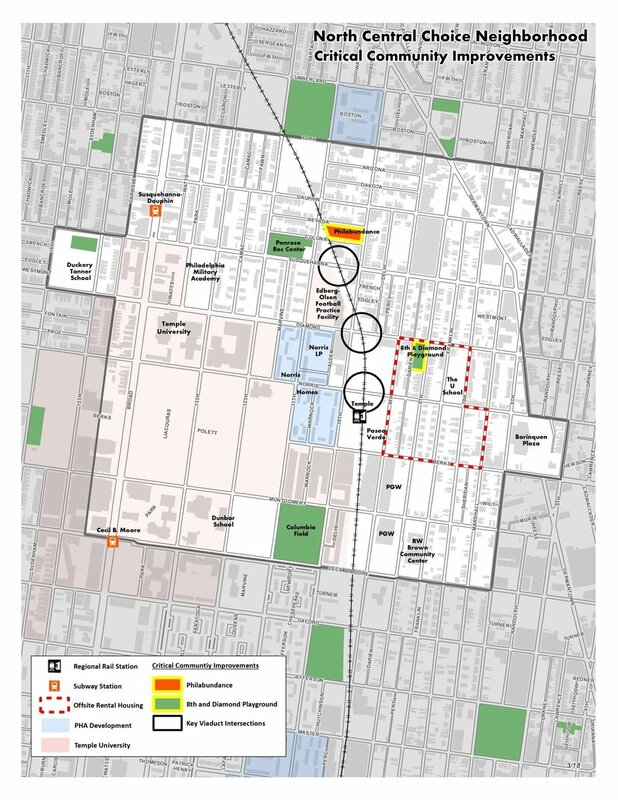 Choice Partners worked with local leaders, Norris Resident Council and residents to develop a proposal to convert the Philadelphia Redevelopment Authority-owned site at 11th and W Nevada St into an expanded Philabundance Community Kitchen job training and food production facility. Students who are accepted into the 500-hour program earn their ServSafe certificate; have an externship opportunity in the culinary industry; prepare meals for those in need; and receive retention services by PCK staff for two years after graduation to ensure that students maximize their training and maintain positive work ethics post-graduation. A larger facility with state-of-the art equipment will enable PCK to extend its training program to 16 weeks and to train 220 students. Additionally, a 5-day per week operation in an expanded facility will produce up to 2 million meals for homebound seniors and children during the summer months. Residents have expressed a desire to combat crime and trash and increase safety through lighting installations at three key intersections in the neighborhood. The Community Design Collaborative and volunteer architects, using stakeholder meetings with community groups and city agencies, as well as over 300 surveys completed by community members, developed preliminary designs for the underpasses at Norris, Diamond, and Susquehanna respectively. Additional outreach will inform the finished product for each intersection. See below for the final report from Community Design Collaborative. The third project will address residents’ expressed desire for better recreation opportunities. The 8th and Diamond recreation center and playground provides a community-centered location for such a project. Community conversations will continue to ensure this project addresses resident priorities. A portion of the final Housing Phase of the North Central Choice Neighborhoods includes commercial space at 10th and Berks Street. The space will look to capitalize on the high volume of foot traffic seen here. Berks Street serves as a primary gateway to Temple University’s campus and is located near Temple University Regional Rail Station, one of the busiest stations in the greater Philadelphia Metro Region. This site formerly housed residents of Norris Homes. A use consistent with community wishes and demand is being sought. Making Connections: Conceptual Design for Under the Viaduct presents design solutions to address the challenges presented by the SEPTA Viaduct in the North Central neighborhood of Philadelphia. The goal is to provide improvement strategies that will reduce crime, increase safety, and help to meld the fabric of the neighborhood by encouraging pedestrian access. Three underpasses beneath the Viaduct have been identified as the basis of this design exercise. The underpasses are just north of the Temple University train station and include: W. Norris Street between N. 9th and N. 10th Streets, Diamond Street at N. 10th Street, and W. Susquehanna Avenue between N. 10th and N. 11th Streets. The design solutions address not only these particular intersections, but also linkages to tie them together. While site specific, these designs are also intended to act as prototypes for other similar underpass locations throughout the City. The Community Design Collaborative Final Report is complete. In November 2013, with support from Asociacion Puertorriquenos en Marcha (APM), LISC Philadelphia, and the City of Philadelphia Office of Housing and Community Development (OHCD), the Community Design Collaborative hosted a full-day design charrette that enabled designers, community leaders, public agencies, private developers, and other stakeholders to explore redevelopment strategies for a large vacant parcel at 8th and Berks Streets in Eastern North Philadelphia. This charrette, called Compass, Connector, Catalyst: Re-imagining 8th and Berks, was presented as part of AlA Philadelphia's annual Design on the Delaware Conference. The Design Charrette report can be read here.